My daughter and her friend Jillian are jewelry artists. They met early in their college years. They went to undergrad and grad school together, then Annie moved to Wisconsin, and Jill moved to Texas. Shortly after their moves, they decided to do a collaborative challenge. Each made a “part,” then sent it to the other, who finished it into a piece of jewelry. They did this three times, and ended up having an exhibit and lecture at their undergrad alma mater. (You can read about this and see the pieces here.) Much to their delight, their beloved teacher and mentor came from California to see them! Well, they had such a great time doing this that I was inspired to do something similar. So, around a year ago I asked my friend Kimberly Einmo if she would be interested in doing a “parts exchange” quilt collaboration. She jumped at the opportunity, and I’m so glad! We decided to use Cherrywood fabrics (because, really, who doesn’t love them?!) We would each start with the same colors, and add two main fabrics and up to two accent fabrics. For the first exchange, we decided to make four 16″ blocks, which the other would finish to make a 54″ square quilt. Kimberly picked the first Cherrywood pack. Tropicana. Yummy! For my blocks, I added black and white Kona cotton for my main fabrics, and these are the blocks I made. I used an OESD machine embroidery applique design set to make the paisleys, and embellished the appliqued black frame with 1/4″ strips of the focus fabrics. Because I used a bit of silver metallic in the machine embroidery, I wanted to add that to the rest of the block, so I did a triple straight stitch with the silver thread along all the edges of the strips and frame. …and this is one of her finished blocks. Now, at this point, if you know me and my work, you’re saying, “Wow, these are so not your style!” And you’d be right! But that’s what makes it a challenge! So, I in Kansas sent my blocks to Kimberly in Virginia, and she sent hers to me. We hadn’t seen them until we opened the packages! Then it was time to go to work to figure out ways to finish the other’s blocks into a quilt. I was able to finish my quilt by the time of the Paducah show last April, so I had the fun of “revealing” it to Kimberly, who was teaching there. I turned those blocks on point and added wide blue sashing, then filled in the big corners with simple piecing. Then I got to work embroidering! The leaves and stems are a portion of a design from Emblibrary, and the FSL flowers and narrow dot border are from Zundt. I was going to do one of my FSL edgings, but I tried several designs and colors, and they just didn’t go with the rest of the quilt. By this time, the quilt was quilted, of course, and was too small to be finished at our agreed-upon 54″ size, because I had allowed for a lace border. What to do? Add prairie points, of course! Double prairie points! These ended up looking soooo much better for this quilt than the lace I had planned. Here is Susan Cleveland checking out those prairie points! Okay…on to Kimberly’s quilt. 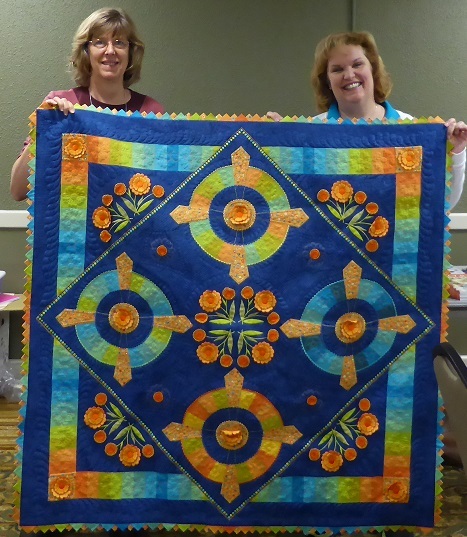 We were both at the Craftsy Instructor’s Summit in Denver this past weekend, when she revealed her quilt to me! I love it! She ended up turning my blocks on point, too, and adding a wonderful Irish chain-ish type setting. She carried the narrow strips and silver stitching out into the border. Birgit Schueller did the gorgeous longarm quilting on this, and you can see how she repeated the paisley motifs in her quilting. We had such a great time doing this that we decided, long before this most recent “reveal,” that it was something we wanted to continue. 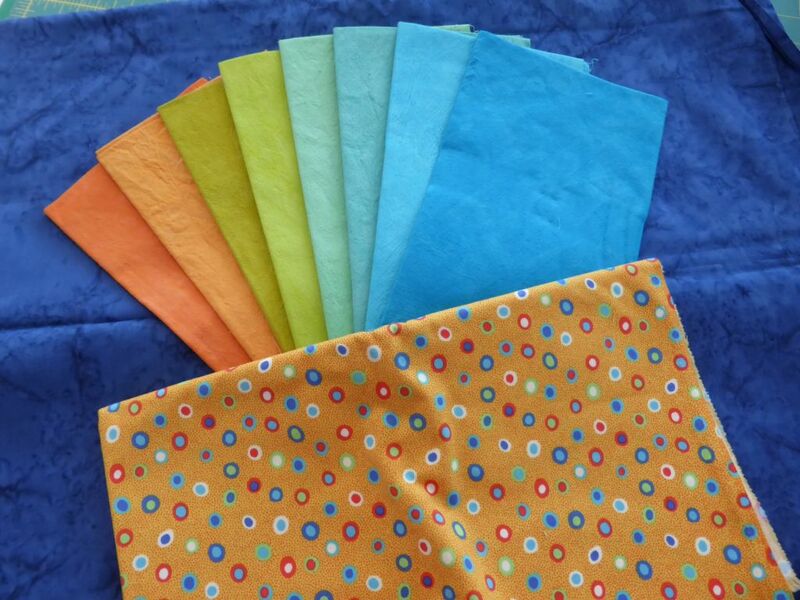 So last fall, I chose the Cherrywood fabrics for our next set of quilts. I wanted something different, so I picked “Thistle.” It was the purple-y blues that got me. But what I apparently didn’t pay attention to were the taupe-y grays and tans. Those are not colors I like, and neither does Kimberly! Again, that challenge! We had to use all the colors in the pack. We decided that for this challenge, we would each make a 24″ medallion, and the other would finish it up to 54″ as before. We got to unveil our medallions in Denver, too. Kimberly decided to make a traditional Lone Star, adding a couple of batiks, and some burgundy and acid green accents. For a while now, I’ve been wanting to try my hand at drafting and stitching a Mariner’s Compass. This was my chance! I added an ivory fabric and a lovely print that I’ve been saving for just the right project. I also added turquoise and dusty pink accent fabrics. Then, after that compass was all pieced (and it ended up flat the first time!) I embroidered the Zundt lily in the center to coordinate with the lilies in the print. I did not want that embroidery to go wrong!!! So now it’s time for us to take our exchanged medallions home and figure out ways to take someone else’s choices and finish them off as our own. We’ll have the big “reveal” sometime down the line. Kimberly is a very popular Craftsy teacher, with four (yes, four!) classes. If you want to learn how to make the most of your piecing, I would highly recommend this delightful teacher! These links will give you 50% off her classes! If you’d like to read Kimberly’s version of this exchange, check out her blog post. I hope we’ve inspired you to grab a friend and start your own challenge! Let us know what you make! I love this idea…you each did a beautiful job, and I think both of your finished quilts are stunning…can’t wait to see what you do with your newest challenge! Good luck and may your quilting fans win. Thanks for the inspiration! My bucket list is to do a Mariner’s Compass Quilt. M’Liss Rae Hawley has a book that I have bought to have to try it……………………..when I have time!! Your projects looked gorgeous. Well done. 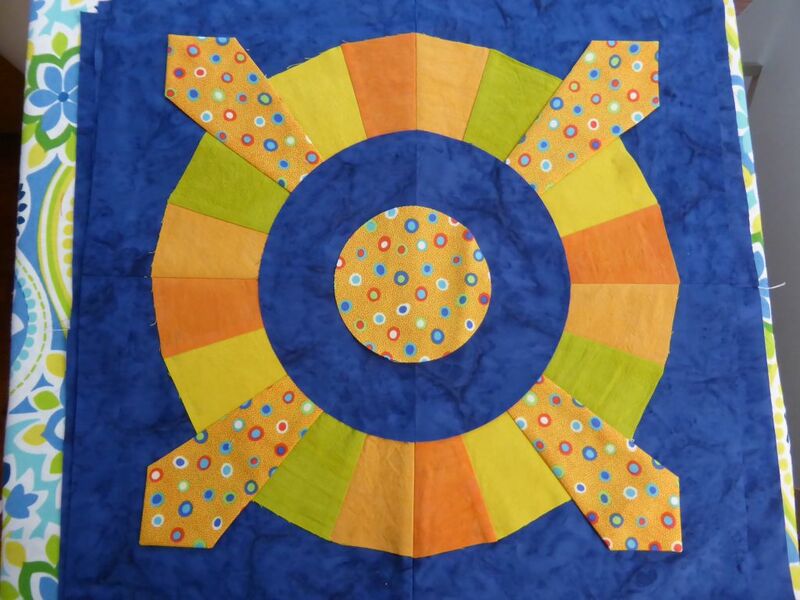 Susan, you two are amazing quilt artists, and the pieces turned out so amazing, colors, shapes, embroidery, etc.! Congrats! I consider you and Kimberly Quilt Rock Stars!! !